The Tragic Deaths of Ananias and Sapphira: What This Story Tells Us about the Decline and Fall of Religion. In the church, there are two kinds of people, and it’s nearly impossible to distinguish them from the outside. 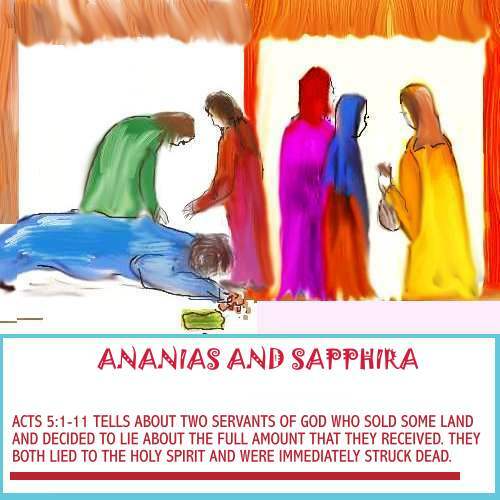 On the outside, Ananias and Sapphira look just like another church member named Barnabas (introduced in Acts 4). Barnabas had just sold his property and brought the money to the apostles, and to the casual observer, Ananias and Sapphira were doing the same thing. But deep in their heart lingered a love of money and a desire for people’s praise. So they conspired together to present a portion of their money while passing it off as the entire amount. This is worlds apart from the attitude of Barnabas, but looks very similar. You mean that there are only two kinds of people in church? One good and the other bad? Why are the bad people going to church anyway if they are bad? How is the church helping these “bad” people? People who have a love of money and a desire for praise are bad? That means about 95 percent of the human race are bad. If all that religion can do is condemn “bad” people, why bother to go to church? To be “Good,” you must tithe, build churches, give large donations and upon your death leave large grants to your church. It may be difficult for us to distinguish between a truly repentant heart and a seasoned faker, but nothing is hidden from God. The Holy Spirit knows our thoughts as if they were being played through a loudspeaker or being displayed on a screen. That is why despite fooling everyone else, Ananias and Sapphira were still found out. There are no locked doors or hidden closets for the Holy Spirit. God is even worse than big brother. Big brother can be hacked and still has blind spots in his/her surveillance techniques. God sees all and knows all. Do not try to hide anything from God. God has nothing to do but spy on us night and day. 24/7 God is spying. Do not do anything that would offend God or he/she will know and your secrets will be shared with the universe. Since your church is your organized representative of God on earth, you should not try to hide anything from your church. Be sure to send copies of your annual tax returns to your local parish or pastor. The closer we are to grace, the greater the offense of sin. First, their deaths—like much in Acts—serve as a sign. God takes something that is true in the kingdom of God and puts it on physical display. We see this most often through the healing miracles, but it is equally true of this judgment. God doesn’t do this with everyone who lies to the Holy Spirit today. But that should not cover up the fact that this death is a picture of how God feels about it. It is a glimpse of the future judgment for all who share in the heart of Ananias and Sapphira. Second, Ananias and Sapphira had seen the activity of the Holy Spirit so closely that the seriousness of the sin increased. Think of it like the temple: the closer you are to the holy place, the more significant is every blemish. These people had seen the mercy of God firsthand. Ananias’ name, in fact, means, “God is merciful.” They had likely been witness to the death of Christ itself! And yet despite being recipients of such great grace, they spurned it for the praise of men. Do not take holy things lightly! Don’t bother trying to be better; you can never be good enough. Furthermore, it is worse to screw up if you are better than if you had not even tried. Whatever happened to forgiveness of sin? In this story, it seems there is no room for repentance. Tolerance is non-existent. No one mourns the deaths of Ananias and Sapphira. Where is the compassion and forgiveness that Jesus preached? It would seem that even at this early date, the newly formed Christian church has soon forgotten the key messages of Jesus. Fear is a part of worship. Unsurprisingly, these dramatic deaths caused a great deal of fear (Acts 5:5, 11). But we may be shocked to see that even in light of this, “more and more people believed in the Lord” (Acts 5:14). Fear is an integral part of worship. For those of us familiar with the idea of an infinitely loving God, this is a jarring realization. But God’s love only makes sense when we know the magnificence of his glory and the might of his power. That is why John Newton wrote, “Tis grace that taught my heart to fear.” As the fear of God increases, so does the sense of his love, because we understand more fully what we have been saved from. My favorite definition of the fear of God is awe mixed with intimacy. We are invited into the closest possible relationship with God, but this intimacy must never overshadow the majesty of who God is. Wow, this is really hard to understand much less accept. Fear is a part of God? God wants us to be afraid of him/her because we are more likely to be saved if we are afraid? As I am more afraid of God, he will love me more? What kind of crazy mixed up logic is this? Where did Jesus preach this or say anything close to this? What is it we will be saved from if only we are afraid? Maybe, this is why psychopaths commit crimes that are so heinous? They have no fear so why should they give a damn? If you are fearless, you have no problem with God. This sounds like a good prescription for a fascist dictatorship. Just keep the people scared and they will stay in line. God and fascism according to the Christian church must have a lot in common. No wonder most religions hate communism so much. Ironic, that so many communist regimes have also used fear to keep people in line. What ever happened to the saying that “You catch more flies with honey then you do with vinegar?” What many religions seem to be saying is that if you scare people to death, they will donate more to the church. 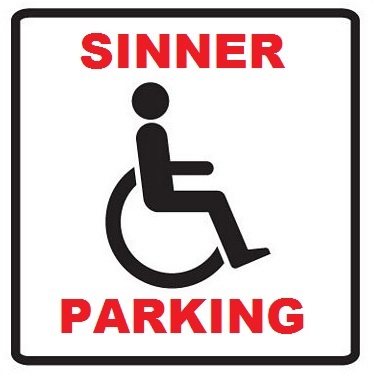 Sin is a deadly serious matter to God. 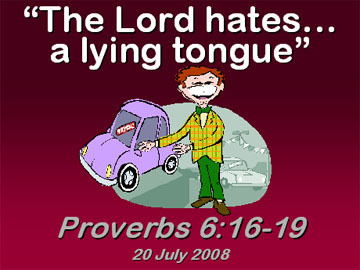 God hates sin and hate sinners? In this case, he/she hated sin enough to kill two members of the church whose sin was keeping back some of their money and lying about it. Wow, this is really scary. If God can just strike any of us dead for such a trivial offense, imagine what he/she will do to most of us for the daily offenses we make. When you think of the Ten Commandments or Eight Beatitudes, you should be really scared. Any second now, most of the human race will be struck dead for failing to comply or live up to these standards. When you think about how many people covet their neighbor’s property, commit adultery, or lack humility or charity, you may wonder that anyone on earth is still alive. Well, you may and will draw your own conclusions but my conclusions are to ask why anyone would belong to any organized religion that subscribed to a single one of the beliefs that were noted by Pastor J. D. If you want to look for reasons why people are less church going or less religious today, you have simply to look at these five beliefs about God and sin that Pastor J.D. has noted. Who in their right mind, would want to belong to any group that felt this way about humanity and sin? Most of the interpretations support the idea of an intolerance that was in the early Christian church from the very beginning. This is not to say that all religions do not share similar intolerances. My best guess is that any system of organized belief is by its very nature “intolerant” of competing or contradictory belief systems. One can only hope that we are not all killed instantly for our failures to comply with whatever belief system we are associated with. Most systems other than religion find it more expedient to kill by innuendo and ostracism then to have God strike you dead immediately. You lose less members that way. Listen to the pain and misery that our sins have caused. Make appropriate amends for our sins to the victims.